Soba noodles are great 'pasta' option, but you need to read the label and be sure they are made 100% from buckwheat and are truly GF. You also need to double check your soy sauce, not all are GF...see where all the reading comes into play? 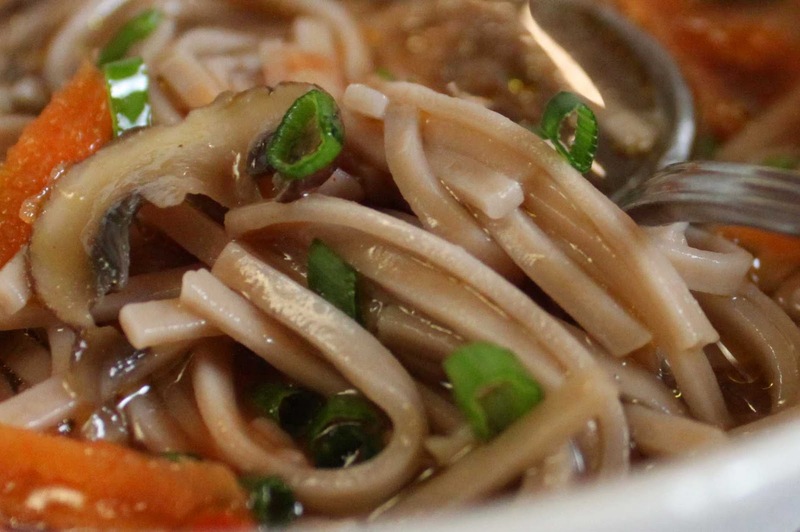 This soup is simple, easy and deceivingly filling thanks to the soba noodles. Use the ginger to flavor the broth without overpowering it. The sriracha sauce gives the soup a final kick, it's okay without it, but it's really better with it. Tips and Techniques: You can just cook the soba noodles in the broth right before serving, but I like to keep them separate so I have more control over the the noodles and they don't become overcooked and soggy. Bring about 6 cups of salted water to a boil, add the soba noodles and cook for about 3 minutes. Drain and run under cold water, set aside. Peel the ginger and cut into large chunks, do the same with the garlic. Add a drizzle of olive oil to the bottom of a soup pot and saute the ginger and garlic to release their flavors, about 3 minutes. Add in the broth and simmer for 30 minutes. Strain out the garlic and ginger. Grate the carrot and add to the stock along with the sliced mushrooms, the vinegar, the sesame oil and the pepper flakes. Continue to simmer just 5- 10 minutes, depending on how soft you want the carrots to be. 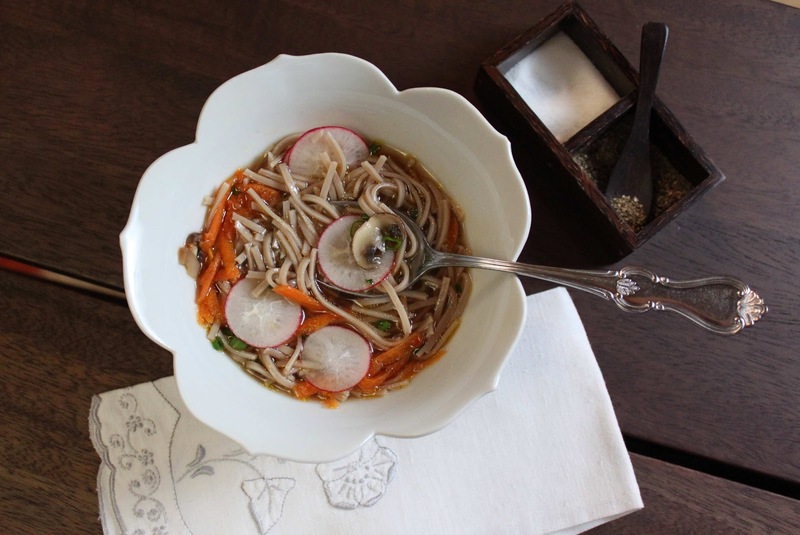 Place a scoop of the soba noodles in the bottom of each bowl, add a scoop of the the ginger carrot broth. Top with fresh snipped chives, radishes and a squeeze of the sriracha sauce. Enjoy!